Hops hail from Eurasia and have been used as a sedative and digestive aid for centuries. Though primarily known now for their key role in beer production, they have much more to offer. Hops have a long history of human cultivation. They were used in salads by the ancient Greeks, and were first recorded as an ingredient in beer during the 8th century. Hops are best known for their significant role in beermaking, providing both flavoring and preservatives to this alcoholic beverage, but they also have several useful medicinal properties. Promoting sedation. Hops can help to relieve insomnia and induce sleep by relaxing the body. Relieving anxiety. The relaxing properties of hops are also useful in treating symptoms of anxiety. Aiding digestion. Hops can increase stomach secretions to improve digestion, as well as to reduce spasms in the digestive tract. Strengthening bones. Research suggests that hops may be useful in protecting against osteoporosis. Hops are also being investigated for their potential effect on menopausal and premenstrual symptoms. The sedative action of hops is due principally to its bitter acids, especially the alpha-acid component 2-methyl-3-buten-2-ol. This compound increases the activity of gamma-aminobutyric acid (GABA), thus inhibiting the central nervous system (CNS) and relaxing the body. This same property can help relieve symptoms of anxiety, which are often caused by an overactive CNS response. 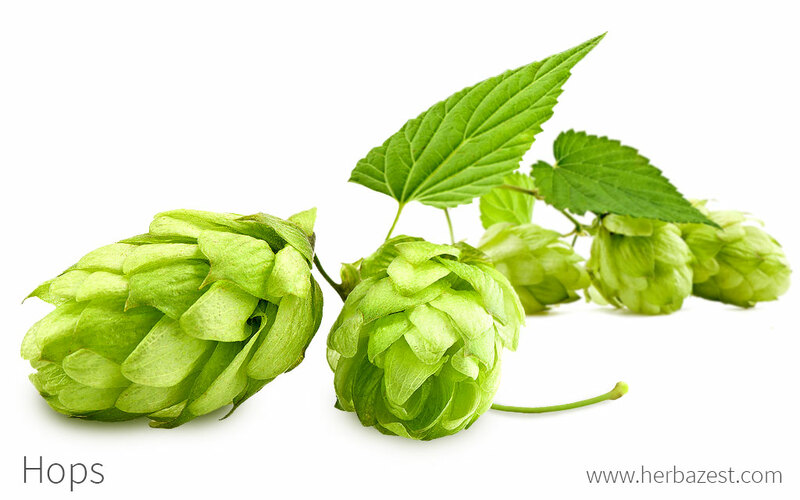 Hops' bitter acids - including lupulin, humulon, lupulon, and valerianic acid - stimulate the gastrointestinal system by increasing secretions that aid digestion. These bitter acids are also known for their strong antiseptic and anti-inflammatory properties. Hops also contain prenylflavonoids, which have been suggested to protect bones against weakening associated with age and, in women, menopause. Hops' bitter acids are believed to provide similar protective effects. Additionally, the phytoestrogenic compounds in hops have been potentially linked to beneficial effects on menopausal and premenstrual symptoms. Lemon balm and valerian also provide sedative benefits, while the bitter compounds in dandelion and chicory promote good digestion. While hops are mostly safe for consumption, a few side effects may occur. People taking hops have reported mood changes, such as increased nervousness and depression. Additionally, women have reported irregular menstrual cycles, while some men have reported loss of libido. Hops may cause excessive sleepiness if consumed in supplemental form along with alcohol or sedatives. People with hormone-sensitive conditions, such as breast cancer or endometriosis, should also exercise caution before taking hops because their phytoestrogen content may affect or worsen these conditions. An allergic reaction to hops is possible and may include symptoms such as chest pain, breathing problems, hives, rash, or itchy and swollen skin. Hops are not recommended for pregnant or breastfeeding women because of a lack of research about the effect of hops on fetal development and infants. Although hops are most commonly consumed as an ingredient in beer, there are several medicinal preparations of hops, as well as a few culinary preparations, that better impart the plant's health benefits. While it is not common worldwide to use hops in food, some Eastern European countries have traditionally added cooked hops to their meals, and the practice is becoming more popular with the emergence of craft brewers growing their own hops. Infusion. When brewed into a warm infusion, hops can provide calming benefits, as well as aiding in digestion and strengthening bones. Decoction. Hops leaves, strobiles (cones), and stalks may be boiled to produce a concentrated preparation, which is especially potent for inducing sleep and relieving anxiety. Powder. Hops powder can be added to other foods or beverages to provide calming, anxiety-reducing benefits. Sachets. Dried hops leaves have long been added to aromatic sachets, as their scent is thought to relieve insomnia. Hops sachets were often used as a pillow in the past. Tincture. A few drops of hops tincture provide the plant's sedative, digestive, and osteoprotective benefits. Extract. Hops extract typically comes in liquid form, and several drops can be taken up to three times per day. This preparation aids in promoting sleep and strengthening bones. Essential oil. The oil extracted from the hop plant is often used in aromatherapy to help promote sleep. Capsules. Capsules provide the many health benefits of hops in a simple, easy-to-ingest form that should be taken three times per day. Hops are a little harder to find than other herbs, as they are typically not available at regular grocery stores. Home brew kits are available online for those wanting to try brewing their own beer. Hops in these kits can come in different forms - either in condensed pellet form, or just the leaves from the strobili. To simply have the leaf form for making tea, there are online herb stores that carry it, or it can be grown at home. Several hops supplements are available at large online retailers or online retailers. The capsules are usually available at specialized health stores , pharmacies, and in the vitamin section of some grocery stores. Teas, infusions, and sachets can be made at home using different parts of the plant. The hop plant is a perennial that can live up to 25 years or longer. It is commercially cultivated for beer production, but it can also be grown in a home garden to take advantage of its medicinal properties. The hop plant is propagated by cuttings, specifically runners, which is a part of the plant that grows just beneath the soil surface. Hops grow best in well-drained sandy loam in temperate locations, with plenty of sunlight and vertical space. The ideal soil for hops should have a pH of 6.0 - 7.0. Hops must be watered frequently, especially early on, but the bine and leaves should be kept dry to avoid the development of disease such as downy mildew. An overhead trellis system is needed to grow hops because of the height of the plant's bine (or stem), which can grow to 18 - 25 feet (5 - 8 m). This trellis system can be expensive, but because of hops' long lifespan, it is an investment worth making. Plant hops cuttings in hills spaced eight feet (2.5 m) apart, two to four cuttings per hill. The cuttings should be sown in late spring after the last frost. Once the bines are two feet (60 cm) long, choose just a few of the most vigorously-growing vines per hill and remove the rest. Hops harvest typically happens from late summer to early fall. It can be done by hand or mechanically, although mechanical harvest may be too expensive for those growing hop plants in their own garden or backyard. Hops are susceptible to downy mildew, sooty mold, root rot, and wilt, although several varieties of the plant are resistant to some common diseases. They may also be affected by pests such as hop aphids, spider mites, and cutworms. The hop plant produces annual stems from a perennial root system. It is often mistakenly referred to as a vine, but in reality it is a bine, a plant that produces shoots that climb in a helical shape around a support. These bines grow to heights of 18 - 25 feet (5 - 8 m) and always grow in a clockwise direction. The leaves are dark green, heart-shaped, and hairy. The green, cone-shaped female flowers used in beer production - also called strobiles - grow up to four inches (10 cm) long in clusters. The hop plant's roots can reach up to 15 feet (4.5 m) deep. The hop plant, or Humulus lupulus, is part of the Cannabaceae family, which is comprised of approximately 170 different species with a great variation of characteristics, as this family includes both trees and herbs. The hop plant is now cultivated all over the world, and five main varieties from five different regions have been officially recognized and classified. In Europe, as well as western Asia, farmers grow H. lupulus var. lupulus; in eastern Asia, H. lupulus var. cordifolius; and in North America, H. lupulus var. americanus, H. lupulus var. neomexicanus, and H. lupulus var. pubescens. In addition, an immense variety of cultivars has been developed, from the ornamentally-prized "Aureus" (or gold hops) to the award-winning "Saaz", and even the pest-resistant 'Saphir', all of which are favorites among brewers. Hops were used in culinary preparations as long ago as ancient Greece, where they were a popular ingredient in salads. They were first recorded as an ingredient in beer during the 8th century. However, they did not reach England until the 15th century, partially because both Henry VII and Henry VIII preferred the taste of beer without hops. When hops were first introduced, the plant was described as a wicked weed that might endanger the people. Now, it is widely accepted as an integral component of beer worldwide. The hop plant has a particularly interesting past as an herbal remedy in North America, considering that many scholars do not believe it is native to the Americas. The hop plant has been popular ever since it was found to preserve beer and improve the flavor, but demand has greatly increased over the last decade. This increase is most likely due to the popularity of craft breweries and the demand for variety in high-quality beers. According to The Food and Agriculture Organization of the United Nations, the leading producers of hops in 2012 were Germany, with 34,434 tons; and the United States, with 27,782 tons. In the past, the hop plant was used to treat a wide range of health conditions, from jaundice to pain after childbirth and motion sickness. It was even thought to be a cure for epilepsy, with a treatment that involved going to a hop plant and biting the end of a shoot for seven mornings in a row. Beverage industry. Hops are best known as an ingredient in beer, but they are also found in a few soft drinks around the world. Personal care. The essential oils extracted from the plant can be used to in perfumes and skin creams. Textiles. Fibers from the stem (bines) can be used in cloth production. Fertilizer. After the strobili is used for brewing beer, the remaining parts of the plant can be boiled down and used as fertilizer. The hop plant has many uses other than simply brewing beer. This popular herb can be found worldwide and provides many health benefits, in particular sedative and calming effects. Handbook of Energy Crops, Humulus lupulus L.